Townhome in the town of Cody! Welcome to the River Run Ranch Townhome! This clean and up to date townhome is located just minutes from downtown Cody, offering the convenience of in-town living in a quiet neighborhood setting. 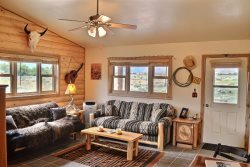 River Run Ranch is a one-level, newly furnished townhome with 2 bedrooms and 2 bathrooms, perfect for a small family or couples. Come enjoy Cody like a local! Please note this property has one only one parking spot and will not accomodate trailers. Could not have been any better, they were all great. - A $39 damage insurance policy which covers up to $3000 is available. Guests may decline this charge, but may be assessed a minimum $250 refundable deposit.